Props go out to Mint Condition Customs for joining the monthly MOTUC Q&A Round-up on He-Man.org! -We read that the SDCC Exclusive will cost $30, is that just for a price increase or it is going to include any other extra accessories or something like that? -It will have a larger number of pieces compared to a standard figure. -Teela’s bio states that the Staff of Ka was used by the Snakemen and its function is to detect any foe’s movements. King Hiss’bio does not mention anything related to the Staff of Ka. How does Teela get it? -Are there any plans to add more figures based on NA per year? It's just that now that we have the Filmation rights and more characters to add to the roster and only one NA figure comes out per year seems like it's gonna take forever to have these characters in our shelves. Will there be more love for NA? -Yes, more and more New Adventure figures are coming. -It's a little bit unclear the process of Adam's transformation in MOTUC.Is the techno sword the sword that was given to Adam when he turned 18 and did the techno vest showed up in the transformation or is it a gift from Duncan, the Goddess or Sorceress? Could you please clarify this a little bit? -The techno sword was created by Man At Arms (in Classics continuity which borrowed from the Horsemen's original pitch for the 200X series) as a tool that could electronically harmonize with the orb of power and give Adam some needed "ummph" on his quest to find both halves of the sword of He. But it did not allow him to transform into He-Man. For that he needed the Sword of He which can magically harmonize with the orb. Once Adam found the Sword of He and united both halves, the Electronic Sword was no longer needed. What happened to it will be revealed in time. The vest was a gift from the Goddess and more info will be revealed on that in time too. -Currently, Fisto's armor, as King Hsss's, is made of a flexible piece which fully protects the torso. Unlike the others, as per articulation issues, which ends where the abdomen starts. Is there a chance, in the future, that Hordak, He-Ro and BA He-Man armor re-designs will come in a Weapons Pak, using that make and model? -Each figure is designed by the Horsemen on a figure by figure basis. We leave these choices to them. 1. All Classics figures are bigger than their vintage counterparts. Nonetheless you made Tytus and Megator 1/3 smaller to save on costs. Why does Granamyr have to be so big that he will cost between 80 and 100 Dollars? Are you planning on reusing Granamyr parts for other figures that big? We wanted to do the biggest figure possible for the 30th but we have heard fan feedback and are looking to scale him back a little to make him a bit more affordable. We will have the final size and costs at SDCC along with a visual of what he will look like. 2. There have been plans for a futuristic He-Man series by filmation with a well known image of the characters Air-Bag, Fork-Lift, Kay-La and two new designs for Man-E-Faces and Ram-Man. Are these characters available through the filmation rights and on the table? We do have access to these characters but nothing to announce right now. 3. In the 80ies Angella had an action feature that let her wings flap. Many fans complained about the drums on the Sorceress's shoulder. Would you consider going another way on Angella like the joints on Buzz-off? We have not gotten to her yet so this type of conversation simple hadn't taken place. 4. Would you consider doing more secret accessories for SDCC? We will do secret accessories as long as it is something fans and customers enjoy! And so far they have. 5. Would you consider doing couples like Shokoti and Lord Mask as a two pack as you did a three pack for the Star Sisters? It is always possible. We never want to force anyone into a multipack but if there is a compelling reason it is not off the table. Will the SDCC reveals be on G4's Attack of the Show again? No, they will be on mattycollector.com this year in our news section. Mattel and MEGA brand just announced a partnership, any chance for MOTU MEGA Blocks or any other collector type brands? Mattel and MEGA Brands Inc. recently announced a multi-year global licensing partnership to develop construction toys based on the Barbie® and Hot Wheels® brands. The new lines will be at retail starting in spring 2013. If the partnership expands to Matty Collector properties, we will be sure to let you know about availability. 2.) Joe Martin asks: i had asked a question last time about when the winner of the character contest will be announced.i meant to ask will they be informed ahead of time if the winner doesn’t live in california and will they be flown out to the comic con ? The winner will not be notified ahead of time and will find out at our fan panel along with everyone else! MOTUClassics.Com Asks: Between the DC/MOTU 2pks and quarterly variants, Mattel has refreshed seven of the original 8-back figures with at least one second version (Battle Ground Teela, Comic Colors Mer-Man, etc). Does the MOTU team feel that Beast Man simply doesn’t have a compelling “second look” that would warrant a new figure or have you just not gotten around to him? Beastman just never made it into one of those packs but a repaint or an update would be great for him! Maybe in mini comic colors? Without the DCU vs. 2 packs however we have a limited venue on how to release redeco only skus as most collectors do not want repaints in the sub. The TRU 2 packs was our vehicle for delivering repaint skus and without it we are at a standstill on these type of figures. DCClassics.Com Asks: Toy Guru, what are you thoughts on the limited success of recent figures that made use of alternative materials? 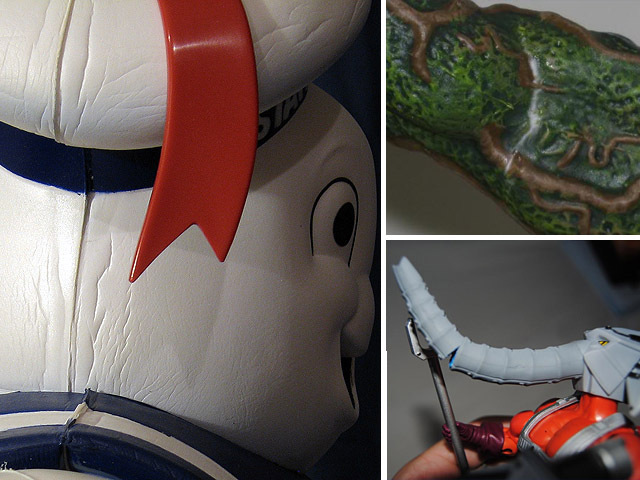 (Stay Puft, Swamp Thing (via Critical Mess) , Snout Spout (via He-Man.Org)). The novelty of the materials is certainly promising in the planning stage, but has the execution of the toys lived up to what you and your team had intended? Are you still interested in using alternative materials for future figures across the lines you oversee? We are moving away from other materials to maintain consistency and avoid any QC issues. While we are always pushing the limits, recent items have clearly backfired and did not work out as planned. DCCollectors - With the price of oil seemingly on an endless rise, can we expect a price increase across all products in 2012? Matty - We will have price increases to all of our online items in 2013 which will be reflected in the sub prices announced at SDCC 2012. Thus far, the New Adventures sub-set has featured characters which were previously released as figures in the 1990-92 line. Will the plan for this sub-set be to continue releasing new versions of previous figures, or will we also see some New Adventures cartoon characters captured in plastic for the first time? We do have access to the animated characters. We’d love to know from fans whom they would want to see! See what the fans have to say about these answers HERE!